Once an evaluation is completed, an individualized treatment plan is developed based on those results. Therapy can range from one to four sessions per week with parents and caregivers as active participants in those therapy sessions. Did you know that research tells us that young children have about 12 hours in a day that they are active and learning. 12 hours X 7 days a week = 84 hours of learning in one week. One hour of therapy per week is a drop in the bucket! That is why we invite parents, grandparents, siblings, aunts, uncles and whoever else wants to attend into the therapy session to be an active part of the therapy process. Parents will leave with a home program that helps integrate weekly goals into those other 83 hours during their daily routines for maximum progress and the knowledge and confidence they need to carry out that home program. Chesney Center Therapies offers a range of clinical services for individuals with autism spectrum disorders, including screenings, evaluations, individualized treatment plans, and social groups. Parents and caregivers are encouraged to be active participants in each therapy session to learn techniques and strategies that will enhance their ability to interact and communicate with their child. At Chesney Center Therapies, you will find therapists who are trained in the Greenspan Floortime Approach™ a type of child-centered play therapy that encourages parents and caregivers to follow their child’s lead and engage the child by entering into a shared world through play. 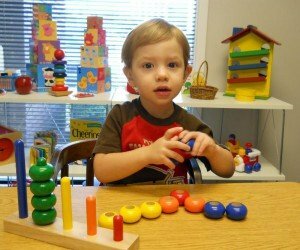 Parents are taught to understand their child’s individual developmental and sensory differences and utilize techniques to address these differences to create purposeful communication and develop meaningful relationships.